And I was going to pick up a box this Friday. For those of you lucky enough to have a box of these holiday treats - rationing is in order! How could you even place a smilie in a situation like this?!! Our Chapel Hill store was out of the cordial cherries AND chocolate stars last week. Had to make a run to the Cary store. You can't mess around with these things. WRAL should post updates. Rationing? you ration the Jo Jos? we ate our box in one sitting. Life is short...eat the Jo Jos first! for us unfortunate souls who have never heard of said confection-please describe. Will I be pelted if I say picture makes them look like Oreos? Are they only available during holidays? Should I brave the dangerous weather just to say I found them? How much do they cost? How have I lived this long without hearing of these? Has anyone tried looking for these treats on ebay? Even if you have to pay twice as much...it sounds like it may be worth it!!! Will I be pelted if I say picture makes them look like Oreos? Aw, I have enjoyed reading your posts on city data. While stoning with cookies takes longer, it can be accomplished. You will be missed around here. for us unfortunate souls who have never heard of said confection-please describe. 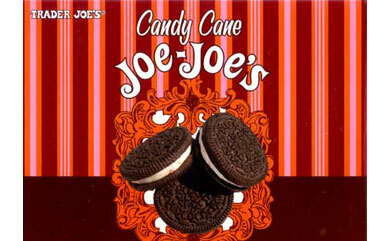 It's heaven in a cookie...Trader Joes version of an Oreo (minus HFCS) w/ crushed candy canes in the creme! They are indeed on eBay. Every year I get a box and HIDE them as a Christmas present to the hubby that is always enjoyed and never lasts long. On Tuesday, when I lamented to an employee that my boxes had been eaten, she went to the back of the store and produced a "less than perfect" box of Joe-Joes. She said that they don't put these boxes out to sell, but you can buy them if you don't mind a slightly imperfect box. I have a possible substitution you could consider. There's a woman in the area who provides Whoopie Pies to Whole Foods. (They are to die for!). She has been making them with peppermint filling. Although the chocolate part is cakelike and not crunchy like an oreo, I can't even imagine how good these must be. Her "regular" varieties, chocolate, oatmeat and peanut butter are completely addictive. I recently went through a chocolate whoppie pie withdrawl. That's how great they are.